Isn't it confusing to pick one good longboard when there're so many best longboard brands? Each of them again got so many longboards, cruisers, skateboards reaching out to the people's heart. 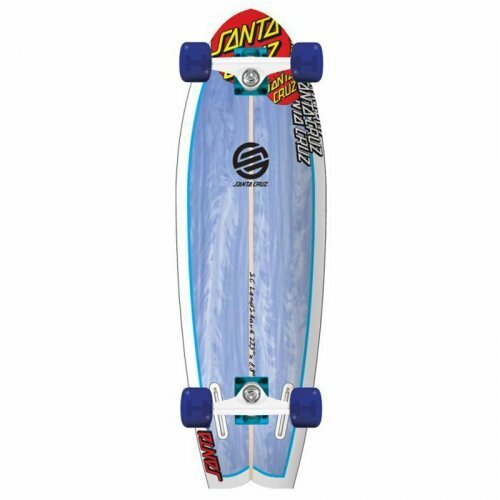 For example; Santa Cruz longboard skateboards. How to identify the best Santa Cruz Skateboards? 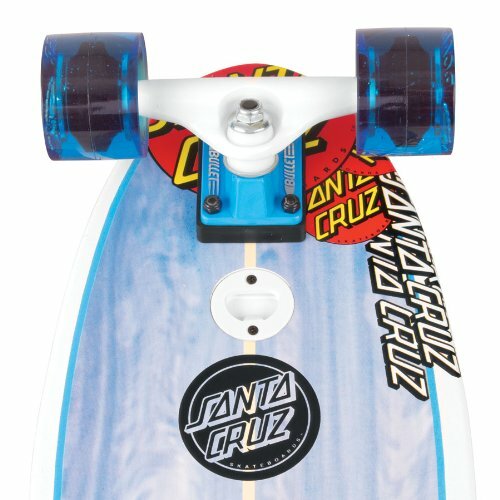 Need some help with the best Santa Cruz longboards reviews? You have come to the right place. 9 plies of finest Maple wood. 7-ply of Maple wood with Land Shark graphics. 7-ply of premium Maple wood skull graphics. 1-ply of Maple with with Retro Shark artwork. 8-ply of Maple wood with Bright Rasta Lion graphics. 36.52 inch (L), 9.34 inch (W), 29 inch (WB). 27.7 inch (L), 8.8 inch (W) 16.5 inch (WB). 27.7 inch (L), 8.8 inch (W), 16.5 inch (WB). 40 inch (L), 10 inch (W), 31 inch (WB). 65mm 78a Road Rider wheels. Soft 65mm 78a Road Rider Wheels. 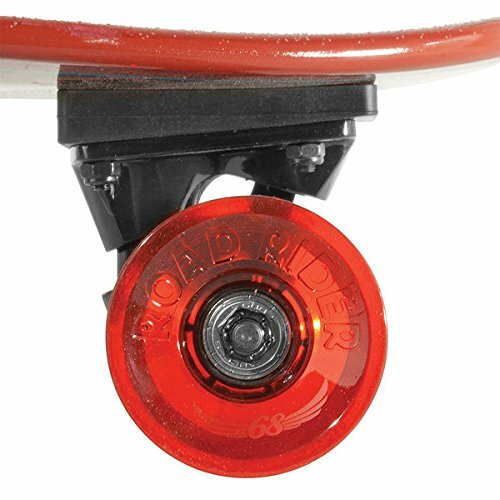 Translucent red 65mm 78a Road Rider wheels. 75mm 78a Road Rider wheels. 180mm Road Rider trucks with low 60mm Axles. Clear Santa Cruz grip tape. Sand spray on Santa Cruz grip tape. Black Santa Cruz grip tape. Perfect for cruising, carving, downhill riding and freeride. Cruising, carving, freeride, downhill riding. Ideal for both beginner and expert riders. Symmetrical drop down board with top mounting. Stable even at a high-speed. Deck cut near the wheels to prevent wheel bites. Small, eye-catchy with twin fins. Though skateboard, but performs like a longboard. Comes with a bottle opener. Cruiser skateboard with twin fins. Surfboard inspired design. Look inspired by surfboards with twin fins. Drop-down mounting with low center of gravity. Don't be surprised if I tell you that now you can surf without water! It's true. The best surfboard manufacturer has taken longboarding to a whole new level with its Santa Cruz Skate Land Shark Sk8 Powerply Complete Skateboard featuring twin fins just like the surfboards. The amazing shark graphics let you experience surfing on land without ripping the waves. You can say, this Santa Cruz cruiser has advanced and now gliding the land instead of water. The first and foremost feature that worth noticing is its brilliant structure and design; a 27.7-inch 7-ply wood deck with a 16.5-inch wheelbase. Not to forget, it got a 2.7-inch nose and 4.3-inch tail. It got Bullet B137 trucks fitted close to the nose pushing it up while turning. If you rest your foot on the nose, you can easily lift the back wheels up. Apart it got 65mm 78a Rod Rider wheels which are undoubtedly soft and grippe. Together they ensure, you can slide, curve and perform tricks smoothly. 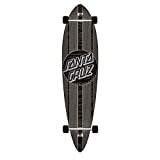 These Santa Cruz boards offer you all the features of a longboard in petite dimensions of a skateboard. Being smaller and lighter than a longboard, it is known as the best cruiser with great portability and a bottle opener! Now, that's what you call a multi-purpose ride! · It's eye-catchy with great graphics – definitely going to grab some attention. · The 27-inch deck made of 7-ply of wood is sturdy and stable. · Though a skateboard, but performs like a longboard. · Slides and carves smoothly irrespective of the surface. · Being smaller and lighter, it is easier and more convenient to carry around. · Amazing for performing tricks. · Not ideal for high-speed long downhill riding. 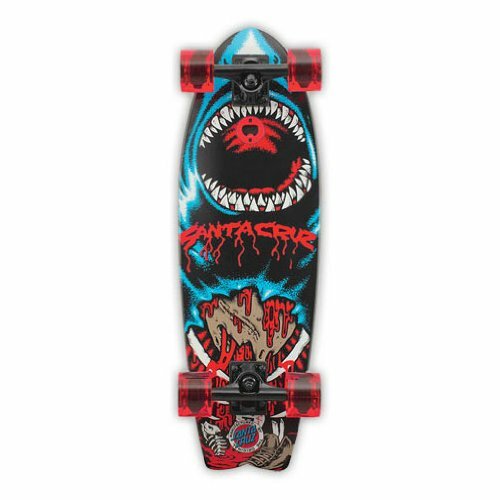 Another amazing cruiser board from Santa Cruz's Land Shark collection is Santa Cruz Sugar Skull Shark Cruzer Skateboard. It got a twin fin that will make you a feel of surfing on the land. It is a real treat for those who love surfing! All the parts of the Santa Cruz boards are made by the manufacturer itself ensuring high-quality. This Santa Cruz cruiser is completed with red 65mm 78a Road Rider wheels, ABEC5 bearings and black B137 Bullet trucks with angled risers, which guarantee you the best cruising experience ever. It is fast, stable and smooth. It is so compact and lightweight that you can easily stack it into your locker or backpack when not riding. The big bang is that it got an inlaid bottle opener… What else you need after a ride? It got a 27.7-inch deck constructed with maple wood with a clear Santa Cruz griptape sand sprayed on both the sides. It got a 2.6-inch nose and 4.3-inch tail along with a wheelbase of 16.5 inches. The skull graphic is enticing and adds a lot of thrill to your ride. The thrilling skull graphic and the red color make it unique and exciting. Santa Cruz manufactures every component of the board – ensuring high-quality. Twin fins and nose give you the "surfer feel". Compact size – 27.7-inch long, 8.8-inch wide with a wheelbase of 16.5 inches. Not less than any longboard – smooth, stable. Sturdy construction with Maple wood. The short tail doesn't make it ideal to perform ollies. The most recent and popular addition that Santa Cruz made to its Land Shark series is the Santa Cruz Retro Land Shark Cruzer. Not just the deck, but each and every part used in this board is a Santa Cruz product. The manufacturer has just evolved more in this cruiser board. The Retro Land Shark got a powerply constructed deck with a length of 27.7 inches and 8.8 inches width. It got a good wheelbase of 16.5 inches. The 4.3-inch twin fins and 2.6-inch nose add to its beauty and surf-like experience. The only difference is that you tear the land instead of the waves. Not to miss, the Retro Shark artwork makes it the bad boy of all cruisers. The lucid spray on Santa Cruz griptape doesn't even impede its aesthetic value. It comes complete with black Bullet 137 trucks, clear red 65mm 78a Road Rider wheels, Santa Cruz ABEC7 bearings, wedged riser pads! In fact, it got a bottle opener in the deck. Now your Land Shark will open a soda bottle for you after a long tiring ride! · Retro shark artwork is truly beguiling. · The sturdy 27.7-inch Santa Cruz decks come with a solid construction and clear sprayed on grip tape. · Got a 2.6-inch nose and 4.3-inch twin fin – giving you a feel of riding a surfboard. · All the parts are made in Santa Cruz factory – a promise of high quality. · Comes with a bottle opener in the deck. · Great for cruising and carving around. · Smooth, stable and easy-to-ride. · Not ideal for ollies. · Some customers complained about the condition of the board shipped to them, but that appears to be a handful of stand-alone incidents. Need a vent to channel out all your frustrations, stress and anger? Scream out loud… Even better, ride this Santa Cruz Drop Down longboard. It got an amazing artwork that speaks your mind; a hand reaching out and shrieking loud. This Santa Cruz cruiser is going to amaze both the newbie and high-speed lovers with its brilliant features. It is a symmetrical drop down board with top mounting is perfect for downhill riding as well as freeride. No matter now great board looks like, but if you get a single wheel bite everything is ruined. Great that this Santa Cruz longboard would provide none as it is little cut away near the wheels. Further, it weighs only 8 pounds. The 36.52-inch decks of these Santa Cruz downhill longboards are made of 9 plies of premium Maplewood. It got a good wheelbase of 29 inches. Being 9.34-inch wide, there is ample space for the rider to rest his foot. The platform drops down into radial concave that supports the rider's foot and comforts him. After all, it is important for the rider to be comfortable at first place to enjoy the entire ride. Not just the deck, Santa Cruz has manufactured each and every hardware used in its boards with absolute precision. These Santa Cruz boards come fully equipped with 180mm Road Rider trucks, 72mm 78a Road Rider wheels, bearings and other hardware that contribute to its smooth and stable cruising experience. · Made of 9-plies of finest Maplewood – sturdy and long-lasting. · Great graphics with a hand screaming out – takes all your negativity out. · it is 36.52-inch long, 9.34-inch wide along with a wheelbase of 29 inches. · All the hardware and component are from Santa Cruz factory. · Ideal for all longboards, both beginners, and experts. · Comes with back Santa Cruz griptape. · Ideal for downhill riding and freeride. · The symmetrical shaped Santa Cruz decks are cut around the wheels preventing wheel bites. · None as of now. Those who are crazy about longboards can never deny that Santa Cruz got the most impressive artwork that its contenders. If you are searching for a stylish ride to kick start longboarding with, then this Santa Cruz drop down longboard won't let you down. It is an excellent blend of great looks and style along with superlative performance. 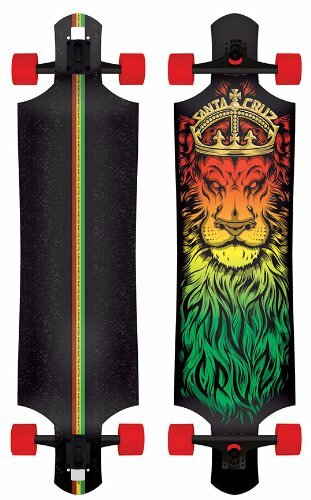 Santa Cruz Lion God Rasta Drop Thru Cruzer Freeride Longboard got a 40-inch long deck constructed with 8 plies of Maplewood. 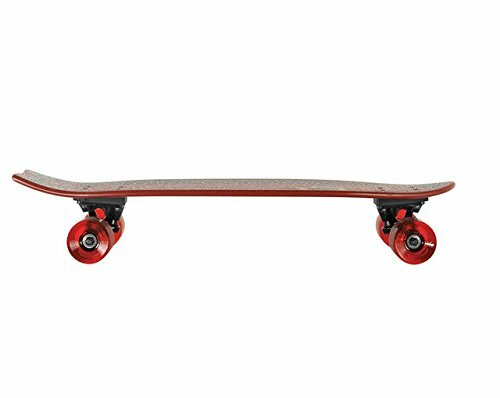 It's wide wheelbase of 31-inch and 10-inch width along with drop-down mounting style, offers stability to the learning longboarders. However, if you are freaky about performance then you may still want for some more. One must notice, that this Santa Cruz cruiser comes fitted with top-notch sturdy parts from the house of Santa Cruz itself. It got 75mm 78a Road Rider wheels which are soft and offers good grip. The 180mm Road Rider with low 60mm Axle and ABEC9 bearings with high-speed lubricants provide extreme stability and ease of riding at all high speeds. · The Rasta Lion God graphics in bright red, yellow and green is mesmerizing. · Made of 8-ply Maple wood – extremely durable and sturdy. · Being 7 pounds, it is convenient to carry when not riding. · Low center of gravity and larger wheels that improves stability. · Being soft, the wheels offer excellent grip at all speeds. · Doesn't bob at high-speed. · Comes with black grip tape with Rasta stripes that suits its artwork. · Counted among the best longboards for riding downhill. · Ideal for cruising, carving, freeride. · Not ideal for performing tricks. · Only a minority has complained about bubbles under the Santa Cruz griptape, which appears to be a manufacturing defect and doesn't influence the ride at all. Every Santa Cruz board is unique with its own looks and features. Your needs define what ride you need. 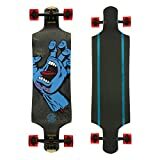 If you are looking for something lightweight but runs smoothly to cruise around and even perform tricks then Santa Cruz Skate Land Shark Sk8 Skateboard and Santa Cruz Skateboards Sugar Skull Shark Cruzer are perfect! They are colorful and inspired by Santa Cruz surfboards. However, if you want Santa Cruz Longboards to cruise around then Santa Cruz Retro Land Shark Cruzer is good. But if you look for something Santa Cruz Downhill Longboards then both Santa Cruz Screaming Hand Longboard and Santa Cruz Lion God Rasta Drop Thru Longboard are equally good. Though, not ideal for performing tricks still Lion God Rasta Longboard would win the race by half a mark for being an all-rounder and comfortable ride. So which one is your favorite ride? Share your riding experience with TeamTSB!